Henrik Fessler has been taking panoramic photos for six years. The fact that the Ricoh Theta S captures fully spherical photos (and videos) at a touch of a button amazes him. 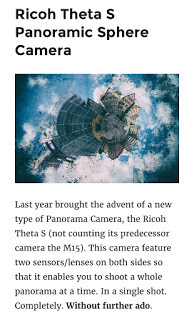 In his article, Henrik explains the laborious process that he had been using to capture panoramas. The technically demanding process meant that only a few photographers could execute it properly. Now with the Ricoh Theta S, literally anyone can capture a fully spherical panoramas. In fact, the Theta can also do 360 videos. What does Herr Fessler think about it? “When looking at the 1:1 detail view, I can see lots of small image errors (Chromatic aberrations, image seams -especially when taking close up images-), let alone having missing capabilities to get the hands at the raw file (you only get a jpg out of this cam) or near to none possibilities to create a high quality HDR image. HERE is his blogpost. Check it out!